Location: Downton on the Rock, Herefordshire, England. Notes: Downton Castle is an 18th-century country house at Downton on the Rock, Herefordshire, England, about 5 miles (8.0 km) west of Ludlow, Shropshire. It is a Grade I listed building. The estate was acquired by Richard Knight (1659-1749) a wealthy ironmaster of Madeley, Shropshire, and in due course passed to his grandson Richard Payne Knight, who created the new house in a Gothic revival style. Knight, an enthusiast of the 'picturesque' style, commissioned landscape artist, Thomas Hearne to produce several drawings of the grounds. Construction started in 1772 or 1773 and was largely completed in 1778. The original south-facing entrance front has a central square tower, six bays to the left terminating in an octagonal tower and five bays to the right flanked by a square tower, the whole resembling a medieval castle with embattled parapets. However, Pevsner considered the inspiration to be the semi-fortified houses in paintings by Claude Lorraine or Gaspard Poussin rather than English castles. 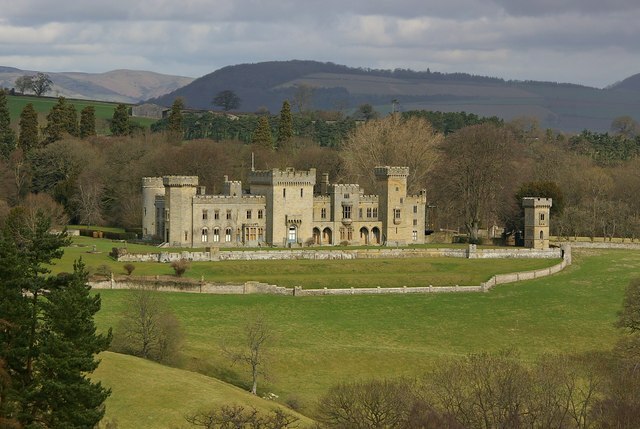 In 1824 Charlotte Knight, daughter and heir to the estate, married Sir William Rouse-Boughton of Downton Hall, Stanton Lacy, Shropshire, (about 6 miles (9.7 km) to the NE of Downton Castle) the 10th of the Boughton Baronets. She bequeathed the estate to their second son Andrew, who in 1857 changed his name to Rouse-Boughton-Knight. He was High Sheriff of Herefordshire in 1860 and at that time began improvements and extensions to the house which included a new entrance and porch, a north west tower, and a chapel. Terraced gardens were created in 1865 by WA Nestfield. In 1881 the family were resident with a retinue of twelve servants. Charles Andrew Rouse-Boughton-Knight died at the house in 1947.